It is interesting how Tallahassee was chosen as Florida's state capital. The story is told that in 1823, two explorers set out — one on horseback from St. Augustine and the other by boat from Pensacola — to find a permanent, central location for the legislature to convene. The two met at a beautiful site that the Creek and Seminole Indians called “Tallahassee,” derived from the words “talwa” meaning 'town' and “ahasee” meaning 'old.' Today, the rendezvous point remains Florida’s capital. While the “old town” has undergone many changes, one thing remains the same — it is still a government town. A government town that is fiercely proud of and dedicated to preserving its heritage. The Capitol buildings, both old and new, are positioned at the top of a hill in downtown, dominating the skyline. They stand as a powerful reminder of Tallahassee’s perseverance. Originally constructed in 1845, and restored to its 1902 splendor, the Old Capitol now proudly stands in the shade of giant live oaks. Under its stained-glass adorned dome and behind its candy-striped awnings, antique furnishings, and political memorabilia, it recollects the past in numerous historical exhibits. The new 22-story Capitol provides a panoramic view of a beautiful, sophisticated Southern city awash in a sea of flowering azaleas, snowy dogwoods, towering pines, fragrant magnolias, and hundreds of shimmering lakes, swamps, rivers, and sinkholes. Admission is free to the Old Capital, although donations are encouraged. Guided tours are available by reservation, but it is recommended that reservations be made at least two weeks in advance or earlier if you plan on visiting during the legislative session. Regular sessions of the legislature begin early in March and continue through April, but can be extended. You may choose self-guided tours as well. 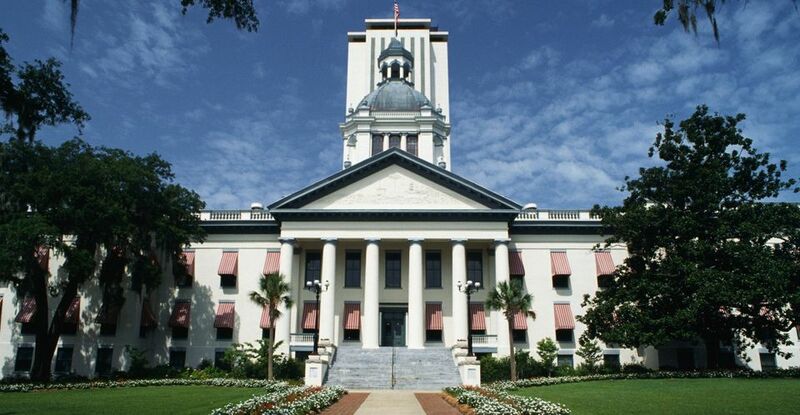 Tour the Florida Historic Capitol Museum any day of the week. For more information, call 850-487-1902. Guided and self-guided tours of the Capitol are available through the Welcome Center located at the West Plaza Entrance to the Capitol. All guided tours require reservations, and tours during the legislative session — March through April — require reservations made months in advance. The Capitol building is open to the public Monday through Friday. The building is closed to the public weekends and holidays. For more information, call 850-488-6167. Unlike much of Florida, Tallahassee enjoys four distinct seasons. Although temperatures are relatively mild during the winter, you'll want to check current weather conditions before packing for your trip.